Seaweed Farming: Boring Or Interesting? Seaweed farmers. It’s maybe not the most …engaging… of travel story ideas, at least on the surface. One of the great things about travel though is that it allows you to drop in on people doing interesting things that you would have never known about otherwise. Like seaweed farming, who knew right? These pictures here are of seaweed farming being done by people who live in Bali, Indonesia. To get the seaweed to grow the seaweed farmers spear bamboo poles into the water and stretch ropes between them, on which the seaweed develops. When the time to harvest the seaweed comes around it’s just a matter of disentangling the vines from the ropes and getting it to the shore. A wet job to be sure, but at least the view is beautiful. 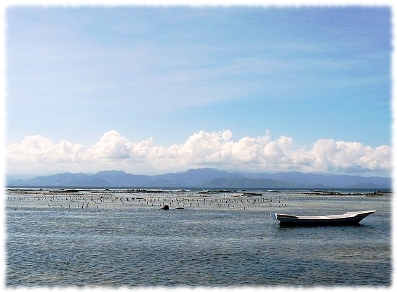 The method used by the Bali farmers is a variant of the ones developed by the first seaweed farmers a long time ago. Seaweed farming first started in Japan in the area of Tokyo Bay, where farmers would throw bamboo branches into shallow, muddy water and there spores of seaweed would build up. A few weeks later the farmers would come back and pick the bamboo branches up and move them to a river. There the nutrients from the river would encourage the seaweed to grow. 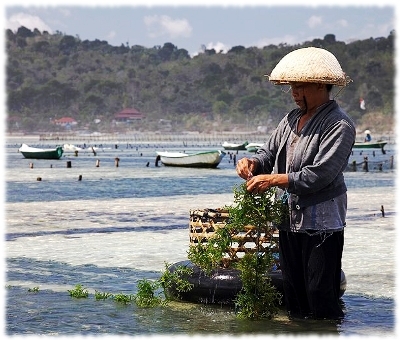 In Bali some tourists enjoy witnessing the seaweed farming and will often interact with the farmers that they come across on the beach, considering the farmers an interesting part of the local scene. But apparently other tourists don’t feel as positively about it. In some areas seaweed farmers face a lot of pressure from the tourism business to quit their farming and free up the beaches for solely tourism use. As for me, I think it would be interesting to see this in action as coming across such unusual things is part of what makes travel such a fun hobby for me. What do you think though, would you want to see seaweed farming if you were visiting Bali or would it be too boring for you?